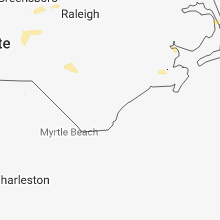 The Minnesott Beach, NC area has had 0 reports of on-the-ground hail by trained spotters, and has been under severe weather warnings 21 times during the past 12 months. Doppler radar has detected hail at or near Minnesott Beach, NC on 34 occasions, including 4 occasions during the past year. 1/20/2019 6:18 AM EST At 618 am est, a severe thunderstorm was located near north harlowe, or near newport, moving northeast at 55 mph (radar indicated). Hazards include 60 mph wind gusts and penny size hail. Expect damage to roofs, siding, and trees. Locations impacted include, havelock, morehead city, newport, south river, cape carteret, north river, merrimon, pine knoll shores, harlowe, broad creek, janeiro, wildwood, great neck, bogue, north harlowe, merritt, cherry branch ferry terminal, minnesott beach ferry, bogue inlet pier and arapahoe. 12/20/2018 9:10 PM EST At 910 pm est, severe thunderstorms were located along a line extending from near fairfield harbour to near wildwood, moving northeast at 60 mph (radar indicated). Hazards include 60 mph wind gusts and penny size hail. Expect damage to roofs, siding, and trees. Locations impacted include, new bern, havelock, morehead city, newport, james city, trent woods, river bend, stella, swansboro, hubert, cape carteret, pine knoll shores, harlowe, silverdale, rhems, broad creek, janeiro, grantsboro, riverdale and olympia. 11/24/2018 1:55 PM EST At 153 pm est, a severe thunderstorm was located near broad creek, or 9 miles southwest of newport, moving northeast at 35 mph (radar indicated). Hazards include 70 mph wind gusts. Expect considerable tree damage. damage is likely to mobile homes, roofs, and outbuildings. Locations impacted include, new bern, havelock, morehead city, newport, cedar island, harkers island, south river, cape carteret, north river, sealevel, marshallberg, davis, smyrna, merrimon, straits, atlantic, pine knoll shores, harlowe, otway and broad creek. 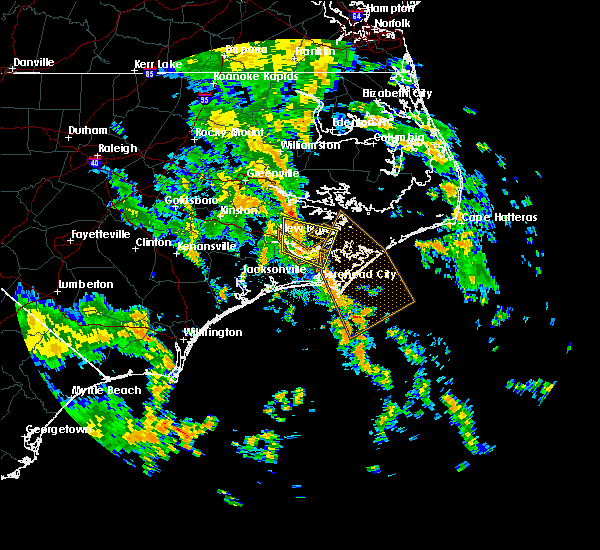 11/24/2018 1:36 PM EST At 135 pm est, a severe thunderstorm was located 7 miles south of bogue inlet pier, or 17 miles southwest of newport, moving northeast at 45 mph (radar indicated). Hazards include 70 mph wind gusts. Expect considerable tree damage. Damage is likely to mobile homes, roofs, and outbuildings. 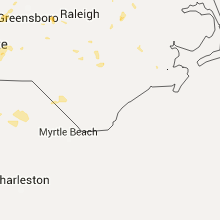 9/14/2018 2:10 PM EDT At 210 pm edt, a severe thunderstorm capable of producing a tornado was located over marshallberg, or near harkers island, moving northwest at 50 mph (radar indicated rotation). Hazards include tornado. Flying debris will be dangerous to those caught without shelter. mobile homes will be damaged or destroyed. damage to roofs, windows, and vehicles will occur. Tree damage is likely. 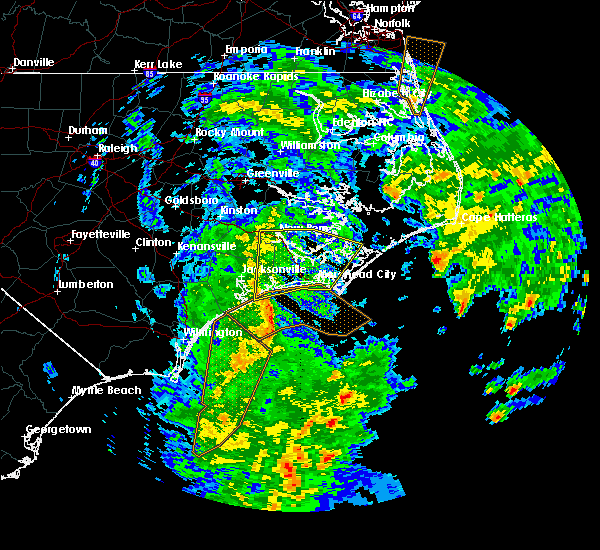 9/14/2018 11:57 AM EDT At 1156 am edt, a severe thunderstorm capable of producing a tornado was located over davis, or 7 miles northeast of harkers island, moving northwest at 55 mph (radar indicated rotation). Hazards include tornado. Flying debris will be dangerous to those caught without shelter. mobile homes will be damaged or destroyed. damage to roofs, windows, and vehicles will occur. Tree damage is likely. 9/14/2018 10:48 AM EDT At 1048 am edt, a severe thunderstorm capable of producing a tornado was located over open grounds farm, or 13 miles north of harkers island, moving northwest at 85 mph (radar indicated rotation). Hazards include tornado. Flying debris will be dangerous to those caught without shelter. mobile homes will be damaged or destroyed. damage to roofs, windows, and vehicles will occur. tree damage is likely. Locations impacted include, new bern, havelock, harkers island, james city, south river, north river, sealevel, marshallberg, davis, smyrna, merrimon, straits, harlowe, askins, cayton, otway, janeiro, grantsboro, great neck and olympia. 9/14/2018 10:24 AM EDT At 1024 am edt, a severe thunderstorm capable of producing a tornado was located near merrimon, or 13 miles north of harkers island, moving northwest at 60 mph (radar indicated rotation). Hazards include tornado. Flying debris will be dangerous to those caught without shelter. mobile homes will be damaged or destroyed. damage to roofs, windows, and vehicles will occur. Tree damage is likely. 7/24/2018 4:36 AM EDT At 435 am edt, severe thunderstorms were located along a line extending from near neuse forest to near janeiro, moving north at 40 mph (radar indicated). Hazards include 60 mph wind gusts. Expect damage to roofs, siding, and trees. Locations impacted include, new bern, havelock, james city, merrimon, cayton, florence, janeiro, grantsboro, great neck, riverdale, olympia, whortonsville, croatan, maribel, nc pamlico, merritt, neuse forest, cherry branch ferry terminal, fairfield harbour and minnesott beach ferry. 6/24/2018 6:40 PM EDT At 638 pm edt, severe thunderstorms were located along a line extending from coastal carolina regional airport to near croatan to hubert to near maple hill, moving east at 35 mph (radar indicated). Hazards include 60 mph wind gusts and quarter size hail. Hail damage to vehicles is expected. expect wind damage to roofs, siding, and trees. Locations impacted include, jacksonville, new bern, havelock, morehead city, newport, pumpkin center, piney green, new river station, camp lejeune center, james city, trent woods, stella, swansboro, hubert, south river, cape carteret, merrimon, harlowe, maysville and silverdale. 6/24/2018 6:16 PM EDT At 616 pm edt, severe thunderstorms were located along a line extending from near trent woods to near kellum to near maple hill, moving east at 45 mph (radar indicated). Hazards include 60 mph wind gusts and quarter size hail. Hail damage to vehicles is expected. Expect wind damage to roofs, siding, and trees. 8/23/2017 8:54 PM EDT At 854 pm edt, severe thunderstorms were located along a line extending from near grantsboro to near fairfield harbour to croatan, moving southeast at 25 mph (radar indicated). Hazards include 60 mph wind gusts. Expect damage to roofs, siding, and trees. Locations impacted include, new bern, havelock, james city, trent woods, cayton, olympia, janeiro, grantsboro, croatan, riverdale, merritt, catfish lake, neuse forest, cherry branch ferry terminal, fairfield harbour, minnesott beach ferry, coastal carolina regional airport, bayboro, alliance and arapahoe. 7/15/2017 5:19 PM EDT At 519 pm edt, severe thunderstorms were located along a line extending from 9 miles north of merrimon to minnesott beach ferry to 7 miles southeast of maysville, moving east at 20 mph (radar indicated). Hazards include 60 mph wind gusts. Expect damage to roofs, siding, and trees. Locations impacted include, new bern, havelock, morehead city, newport, merrimon, maysville, neuse forest, cherry branch ferry terminal, minnesott beach ferry, arapahoe, minnesott beach and stonewall. 7/7/2017 9:46 PM EDT At 946 pm edt, a severe thunderstorm was located near maysville, or 13 miles southwest of james city, moving east at 30 mph (radar indicated). Hazards include 60 mph wind gusts and quarter size hail. Hail damage to vehicles is expected. Expect wind damage to roofs, siding, and trees. 6/24/2017 8:34 PM EDT At 834 pm edt, a severe thunderstorm capable of producing a tornado was located over havelock, moving east at 45 mph (radar indicated rotation). Hazards include tornado. Flying debris will be dangerous to those caught without shelter. mobile homes will be damaged or destroyed. damage to roofs, windows, and vehicles will occur. tree damage is likely. This dangerous storm will be near, cherry branch ferry terminal around 840 pm edt. 6/24/2017 8:26 PM EDT At 826 pm edt, a severe thunderstorm capable of producing a tornado was located near havelock, moving east at 45 mph (radar indicated rotation). Hazards include tornado. Flying debris will be dangerous to those caught without shelter. mobile homes will be damaged or destroyed. damage to roofs, windows, and vehicles will occur. tree damage is likely. this dangerous storm will be near, havelock around 830 pm edt. cherry branch ferry terminal around 840 pm edt. Minnesott beach ferry around 845 pm edt. 6/24/2017 3:40 PM EDT At 339 pm edt, a severe thunderstorm was located near fairfield harbour, or near james city, moving east at 30 mph (radar indicated). Hazards include 60 mph wind gusts and penny size hail. Expect damage to roofs, siding, and trees. Locations impacted include, new bern, fairfield harbour, minnesott beach ferry, bayboro, alliance, arapahoe, minnesott beach and stonewall. 6/24/2017 3:30 PM EDT At 329 pm edt, a severe thunderstorm was located over trent woods, or near new bern, moving east at 35 mph (radar indicated). Hazards include 60 mph wind gusts and penny size hail. Expect damage to roofs, siding, and trees. Locations impacted include, new bern, havelock, james city, trent woods, river bend, neuse forest, cherry branch ferry terminal, fairfield harbour, minnesott beach ferry, coastal carolina regional airport, bayboro, alliance, arapahoe, bridgeton, minnesott beach and stonewall. 3/28/2017 4:52 PM EDT At 452 pm edt, a severe thunderstorm was located 7 miles southwest of river bend, or 12 miles southwest of new bern, moving southeast at 30 mph. recently, quarter size hail was reported with this storm in trenton, jones county (radar indicated). Hazards include ping pong ball size hail and 60 mph wind gusts. People and animals outdoors will be injured. expect hail damage to roofs, siding, windows, and vehicles. Expect wind damage to roofs, siding, and trees. 10/8/2016 2:37 PM EDT At 237 pm edt, a severe thunderstorm capable of producing a tornado was located near smyrna, or 8 miles north of harkers island, moving northwest at 55 mph (radar indicated rotation). Hazards include tornado. Flying debris will be dangerous to those caught without shelter. mobile homes will be damaged or destroyed. damage to roofs, windows, and vehicles will occur. tree damage is likely. This dangerous storm will be near, merrimon around 250 pm edt. 10/8/2016 2:24 PM EDT At 224 pm edt, a severe thunderstorm capable of producing a tornado was located near cape lookout lighthouse, or 7 miles east of harkers island, moving northwest at 55 mph (radar indicated rotation). Hazards include tornado. Flying debris will be dangerous to those caught without shelter. mobile homes will be damaged or destroyed. damage to roofs, windows, and vehicles will occur. tree damage is likely. 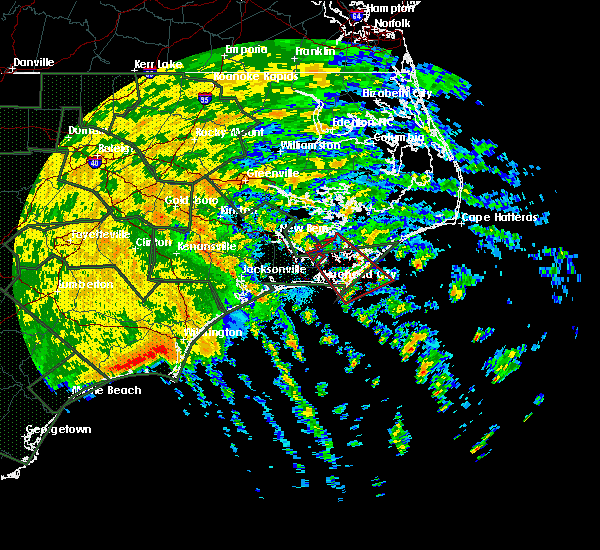 this dangerous storm will be near, harkers island and marshallberg around 230 pm edt. 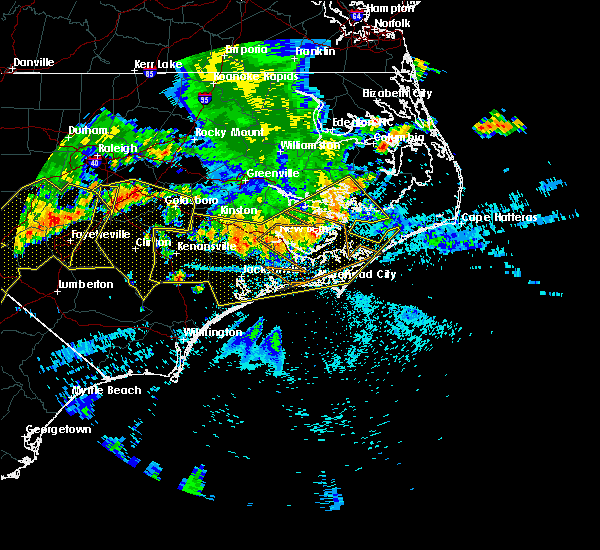 smyrna, davis and straits around 235 pm edt. Merrimon around 250 pm edt. 8/19/2016 5:34 PM EDT At 533 pm edt, a severe thunderstorm was located near trent woods, or near james city, moving southeast at 20 mph (radar indicated). Hazards include 60 mph wind gusts. Expect damage to roofs. siding. and trees. Locations impacted include, new bern, havelock, james city, trent woods, neuse forest, coastal carolina regional airport and fairfield harbour. 8/19/2016 5:18 PM EDT At 517 pm edt, a severe thunderstorm was located over river bend, or near new bern, moving southeast at 20 mph (radar indicated). Hazards include 60 mph wind gusts and penny size hail. Expect damage to roofs. siding. And trees. 8/18/2016 3:50 PM EDT At 349 pm edt, a severe thunderstorm was located near havelock, moving east at 30 mph (radar indicated). Hazards include 60 mph wind gusts. Expect damage to roofs. siding. and trees. Locations impacted include, new bern, havelock, morehead city, newport, minnesott beach ferry, neuse forest, cherry branch ferry terminal and minnesott beach. 8/18/2016 3:30 PM EDT At 329 pm edt, a severe thunderstorm was located near maysville, or 11 miles southwest of james city, moving east at 30 mph (radar indicated). Hazards include 60 to 70 mph wind gusts. Expect considerable tree damage. Damage is likely to mobile homes, roofs, and outbuildings. 5/3/2016 7:02 AM EDT At 702 am edt, a severe thunderstorm was located over james city, moving east at 45 mph (radar indicated). Hazards include 60 mph wind gusts. Expect damage to roofs. siding and trees. Locations impacted include, new bern, james city, fairfield harbour, neuse forest, coastal carolina regional airport, arapahoe, bridgeton and minnesott beach. 7/23/2015 11:33 AM EDT At 1132 am edt, doppler radar indicated a line of severe thunderstorms capable of producing destructive winds in excess of 70 mph. 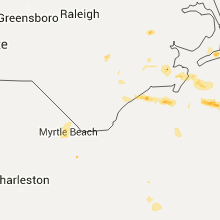 these storms were located along a line extending from 6 miles south of cherry branch ferry terminal to newport to near pine knoll shores to 8 miles northeast of bogue inlet pier, moving southeast at 15 mph. locations impacted include, havelock, morehead city, newport, pine knoll shores, michael j smith airport, neuse forest, rachel carson estuarine reserve, arapahoe, minnesott beach and indian beach. 7/23/2015 11:01 AM EDT At 1100 am edt, doppler radar indicated a line of severe thunderstorms capable of producing destructive winds in excess of 70 mph. 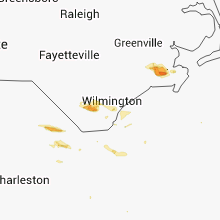 these storms were located along a line extending from near cherry branch ferry terminal to near havelock to 7 miles northwest of newport to 9 miles north of cape carteret, and moving southeast at 15 mph. 7/21/2015 10:36 PM EDT At 1035 pm edt, doppler radar indicated a severe thunderstorm capable of producing damaging winds in excess of 60 mph. this storm was located near cherry branch ferry terminal, or 9 miles northeast of newport, moving east at 45 mph. locations impacted include, new bern, havelock, morehead city, newport, james city, pine knoll shores, minnesott beach ferry, neuse forest, michael j smith airport, cherry branch ferry terminal, rachel carson estuarine reserve, fairfield harbour, arapahoe and minnesott beach. 7/21/2015 10:01 PM EDT At 1000 pm edt, doppler radar indicated a severe thunderstorm capable of producing damaging winds in excess of 60 mph. this storm was located over maysville, or 13 miles southwest of james city, and moving east at 45 mph. 6/6/2015 5:30 PM EDT At 530 pm edt, doppler radar indicated a severe thunderstorm capable of producing quarter size hail and damaging winds in excess of 60 mph. 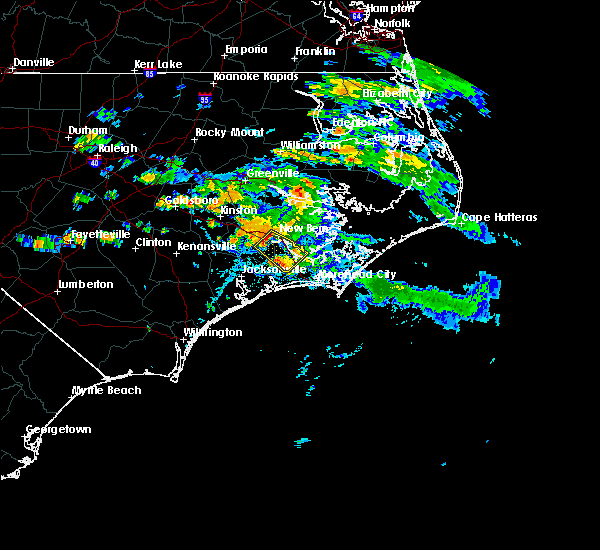 this storm was located near minnesott beach ferry, or 8 miles north of havelock, and moving south at 30 mph. 6/6/2015 5:11 PM EDT At 510 pm edt, doppler radar indicated a severe thunderstorm capable of producing damaging winds in excess of 60 mph. this storm was located 7 miles northeast of fairfield harbour, or 9 miles northeast of james city, moving south at 25 mph. nickel size hail may also accompany the damaging winds. locations impacted include, new bern, havelock, fairfield harbour, minnesott beach ferry, neuse forest, cherry branch ferry terminal, bayboro, alliance, arapahoe and minnesott beach. 6/6/2015 4:53 PM EDT At 452 pm edt, doppler radar indicated a severe thunderstorm capable of producing damaging winds in excess of 60 mph. 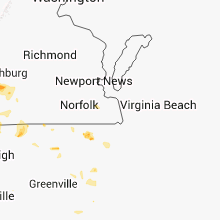 this storm was located 10 miles southwest of aurora ferry terminal, or 15 miles northeast of new bern, and moving south at 30 mph. nickel size hail may also accompany the damaging winds.